Chicago’s African-American community is mourning yet another loss of an institution. On Tuesday, Johnson Publishing Co. announced it was selling its Ebony and Jet magazines to an Austin, TX.-based private equity firm Clear View Group. Re-christened Ebony Media Operations, the publication will remain headquartered in Chicago but will now be owned by out-of-town interests. Johnson has also put its vast photo archive up for sale and is retaining Fashion Fair cosmetics. The sale has marked an end of an era. Johnson Publishing was founded by John H. Johnson, who based his company in Chicago in the beginning. 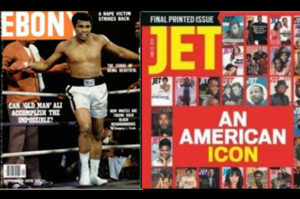 Ebony – a magazine targeted the underserved African-American audience – was founded in 1945, while Jet started in 1951. Jet gained serious journalistic credibility four years later when it published pictures of the deceased body of Emmitt Till, an African-American teenager killed in Mississippi for whistling at a white woman. Jet ceased being a print magazine and became digital-only in 2014. Johnson publishing diversified into other businesses, including Fashion Fair cosmetics and radio stations, including ownership of WJPC-AM (sold in the 1994; now known as religious WNTD-AM) and WJPC-FM (also sold in 1994; now known as WSRB-FM, Soul 106.3.) Johnson Publishing even got into the syndication business at one point, producing and distributing weekend celebrity magazine show Ebony/Jet Showcase in the 1980’s and early 1990’s. Linda Johnson Rice took over operations of Johnson Publishing in 1987 from her parents John and Eunice Johnson. John H. Johnson died in 2005, Eunice W. Johnson died in 2010. Recent times have been less kind to Johnson Publishing. The advent of digital has sent the circulation of revenues of traditional magazines in decline, hitting Johnson the hardest. In addition, Ebony and Jet had to compete with newer black-oriented websites for content including BlackAmericaWeb, The Root, Black Voices (now HuffPost Black Voices), and Media Takeout. The longtime building Johnson Publishing had been headquartered in at 820 S. Michigan Avenue was sold to Columbia College in 2011. The company moved to smaller digs up the street at 200 S. Michigan a few years ago. Ebony is the only Johnson Publishing product left in print. With the structural changes comes some executive shuffling: Desiree Rogers, who took over as CEO of Johnson in 2010 after a short stint as President Obama’s social secretary, will remain with the company but in a less viable role, overseeing Fashion Fair which Johnson still has total control. Johnson COO Cheryl Mayberry McKissack takes over in her place. Also, Kyla Kyles becomes the new Editor-In-Chief of Ebony, which is remaining as a printed periodical. She replaces Kierna Ali Mayo, who has left the company. Ms. Rice remains with Johnson as Chairman Emeritus.